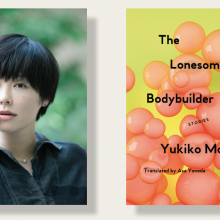 The eleven stories in The Lonesome Bodybuilder are as acute as fiction can get. They are knife-sharp, almost unbearably precise . . . A reader could easily be so transported by the dark-fairytale nature of Motoya’s stories, their glimmering weirdness and constant, sly humor, that she forgets to think about the translator . . . There is wonder in translation, and especially in a translation as thoughtful and skillful as this. The Lonesome Bodybuilder is a rare and absolute treat.